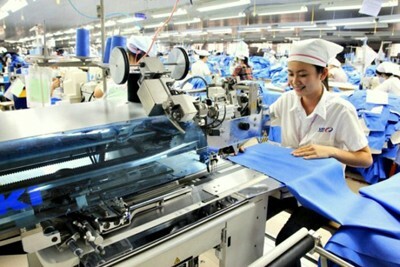 Vietnam earned nearly US$29.4 billion in export turnover from the beginning of the year to mid-February, up 45.8 per cent over the same period last year. Statistics from the General Department of Vietnam Customs showed that this was the strongest growth rate for the beginning of a new year in the past three years. A trade surplus of US$1.7 billion was recorded in the period, it said. In the first 15 days of February, the total value of export turnover reached approximately US$9.2 billion. In just the first half of this month, three product groups reached the US$1 billion benchmark in export turnover, including phones and accessories, textiles, and computers and electronic products. Regarding imports, in the first half of February, the country spent US$7.75 billion importing all kinds of goods, bringing the total value of imports to over US$27.7 billion. Compared to the same period last year, total import turnover also increased by 29.4 per cent. Vietnam’s total foreign trade value was US$425 billion in 2017. The value of exports was estimated at US$213.77 billion, a year-on-year increase of 21 per cent, higher than the 9 per cent annual growth rate of export value in 2016. Meanwhile, the value of imports in 2017 was estimated at US$211.1 billion, 20.8 per cent higher than 2016. As a result, the country maintained a trade surplus of about US$2.7 billion, the same figure as 2016.